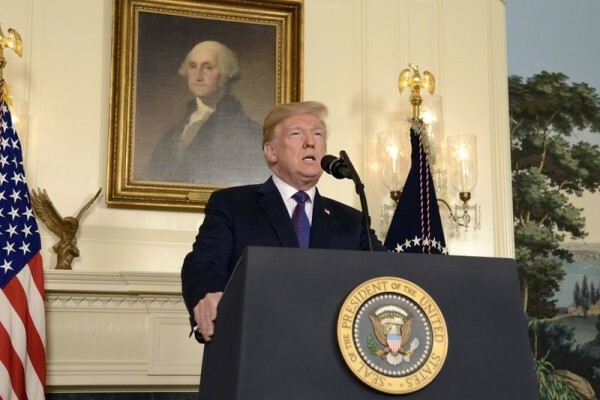 U.S., British and French forces launched military air strikes on multiple government targets in Syria early on Saturday in response to a poison gas attack that killed dozens of people last week. The intervention is the biggest by Western powers against Syrian President Bashar al-Assad in the country's seven-year-old civil war and pitted the United States and its allies against Russia. In a televised address from the White House, Trump said "A short time ago, I ordered the United States Armed Forces to launch precision strikes on targets associated with the chemical weapons capabilities of Syrian dictator Bashar al-Assad." "These are not the actions of a man. They are crimes of a monster instead," Mr Trump said referring to Assad and his role in the chemical weapons attacks. As he spoke, at least six loud explosions were heard in Damascus on Saturday and smoke was seen rising over the Syrian capital. Syrian state TV said the army's air defences shot down 13 missiles fired in a U.S.-led attack in the Kiswah area south of Damascus, the capital. At a Pentagon briefing shortly afterwards, it was confirmed that three targets that had been struck: a scientific research centres in Damascus, a chemical weapons storage facility west of Homs and a chemical weapons equipment storage and an important command post, also near Homs. "The purpose of our actions tonight is to establish a strong deterrent against the production, spread and use of chemical weapons," Trump said. The U.S. president had sharply critical words for both Russia and Iran, which have backed Assad's government. "To Iran and to Russia, I ask, what kind of a nation wants to be associated with the mass murder of innocent men, women and children?" Trump said. UK Prime Minister Theresa May said the strikes were not about "regime change," but "about a limited and targeted strike that does not further escalate tensions in the region and that does everything possible to prevent civilian casualties." May said while the strike was targeted at Syria, it sent a message to anyone who used chemical weapons. Britain has accused Russia of being behind a nerve agent attack on a former Russian spy in England last month, a charge Moscow has rejected. "This is the first time as prime minister that I have had to take the decision to commit our armed forces in combat and it is not a decision I have taken lightly," she said. "I have done so because I judge this action to be in Britain's national interest. We cannot allow the use of chemical weapons to become normalised within Syria, on the streets of the UK, or anywhere else in our world." French President Emmanuel Macron said France had joined the US and Britain in an ongoing operation of strikes to target Syria's chemical weapons facilities. "We cannot tolerate the recurring use of chemical weapons, which is an immediate danger for the Syrian people and our collective security. "The red line set by France in May 2017 has been crossed," he said. U.S. Defense Secretary James Mattis said the air strikes on targets in Syria were a "one time shot" to send a strong message to Syrian President Bashar al-Assad. He told reporters there were no reports of US losses in the operation. Russia's ambassador to the United States warned that there would be consequences for the U.S.-led military strikes, adding that it was not acceptable to insult Russia's president. Russia's Foreign Ministry said Syria had been attacked just as it had a chance for peace. Spokeswoman Maria Zakharova wrote on Facebook: "First the 'Arab spring' tested the Syrian people, then Islamic State, now smart American rockets. The capital of a sovereign government, trying for years to survive under terrorist aggression, has been attacked,"
A senior official in the regional alliance that has supported President Bashar al-Assad in the Syrian war has said the attack on Syria will be seen as limited if it is now over and there is no second round of strikes. Syrian state TV said the attack was being confronted by the pro-Damascus "anti-terror axis", a phrase suggesting that Assad's foreign allies, Iran and Russia, may be helping to defend Syria. Syria has denied carrying out the attack and warned that Western military strikes would risk starting a war.